I have it framed, sitting on my bathroom cabinet. I see it every day. But I don’t think the full impact of it has really sunk it until now. 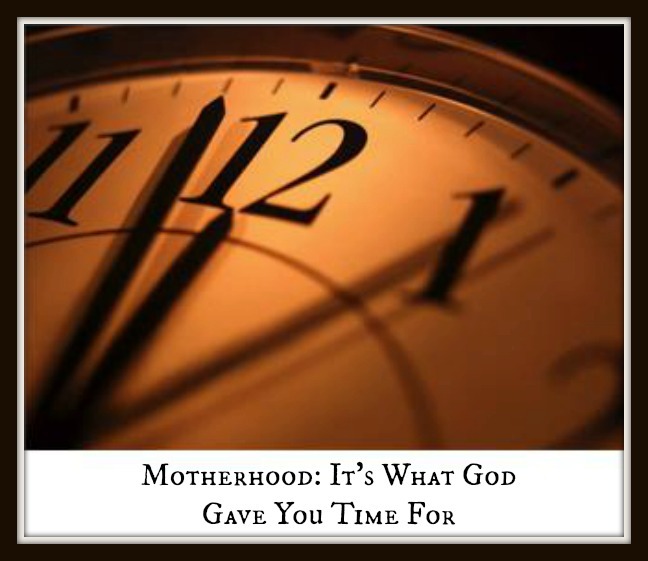 The last sentence…“It is what God gave you time for.” packs a meaningful punch. One that we too often fail to really grasp. If I’m not careful, I can let my children irritate, frustrate and aggravate me into being a really awful mother. But if I look closely, the things that bother me most often are just part of parenting, part of taking time to help little people learn to grow up–the very thing God gave me time for. But if we’re busy with other pursuits, our children and all their needs become a peripheral endeavor, easily “bothersome” to my schedule or agenda. But these children ARE my agenda! In the tiniest moments of the day they are learning and I am teaching. Everything from teaching them how to stir a pot of spaghetti sauce without splashing it to helping them develop important habits of character and ultimately to showing them their desperate need of a Savior because they can’t just “be good”, is my most important job as I act as helper to my husband and keeper of my home. It’s hard. It absolutely requires a sacrifice of what we might rather do with our time and energy. But as I get it, as I say “no” to the pursuits that are not my first responsibility and I focus my attention, time and effort into guiding, training and teaching these little sheep of mine, it changes my response, gives me more patience and my work becomes a joy, even amid the sacrifice and struggles. In this short season of mothering, I am committing anew to slow down and take time to tend this flock of mine. To love them, to teach them the gospel by patiently showing them my daily need of a Savior and theirs, of the One who forgives again and again and wipes the slate clean each day; both my sins and theirs. It’s what God gave me time for. I wish I didn’t need as many reminders about this as I do. Ouch, and thank you. So six of us pile in our car after church, and it’s not even five minutes and I’m ranting at the kid next to me for just being a kid. Groan. You know it’s bad when everybody in the vehicle goes silent, and you know eyebrows are up and jaws are down, even though you’re not looking at them, lol! Irritated (and subsequently unkind) by my kids just. being. kids. And the reason? Once again I forgot they are not hindering me from my work they ARE MY WORK, as you shared so well. Looking forward to abiding in the Vine tomorrow and producing the fruit of love in my home!!! Thanks for another timely reminder, Kelly. The hard part for me is finding the balance. So many of the “pursuits” that seem to take me away from my children are things I’m doing FOR them, i.e. preparing for the coming school year, doing laundry, etc. Praying for wisdom to know when to do what! This is possibly the best post I have read on this blog. How perfectly true. We need our Savior for every moment of every day. Our true calling is growing and training this next generation, not that our only identity as a woman is in being a mother, but it is our priority. Thank you! Thank you for this post! I think as mom’s we get in that way just because sometimes we fill so many roles in our families life and these kind of gentle reminders from our sisters in Christ are just what we need. Kind of like a pep talk from a coach! Let me tell you there are so many days I read your posts and just say man I wish she could come for a cup of coffee and some yummy treats, I love your wisdom! Amber–Don’t tempt me with coffee and sweets 😉 I’m a sucker. Thank you so much for the reminder and the encouragement…. instead of being frustrated with how little I can accomplish with 3 children ages 3 and under, I must see them as my primary ‘job’ and take each moment to train and love. May I reblog with a link? Thanks! You are more than welcome to copy an excerpt and link back. Thanks! I really needed to hear this today! Thank you, thank you, thank you! I have become consumed with selling online to be able to purchase various books we need/want for the upcoming school year. It’s a perfect example of allowing good things to take the place of the best things. It can become very addictive. How is Kaid doing? Are you getting any stretches of sleep? Would love to hear when you are able so we can be praying. 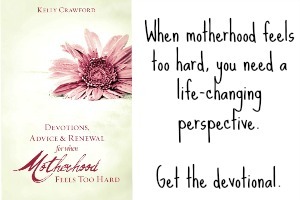 Also, do you know when the introductory price of the new ebook, Overwhelmed, ends? The intro price ends Friday. We all need reminders like this. I found myself getting caught in that rut where I feel like I’m doing 20 million things at once and just don’t have the time for _____. When my 7 yr old looked at me and said “Mommy don’t you love me anymore.” That was the day I realized that I was putting things before the children God gave me to raise. That was also the day I backed off of so many things. I realized we are all happier when I put the kids before the work. And surprisingly enough I am realizing that the work is actually getting done quicker & much easier than while I was struggling to “do-it-all” and pushing the kids to the back burner. Funny how that works isn’t it?